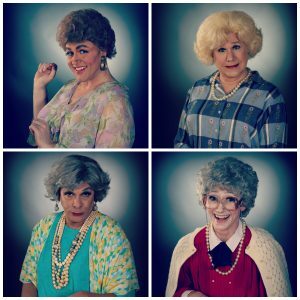 THE GOLDEN GIRLS THE LOST EPISODES by David Cerda, directed by Shade Murray, playing will present a special fundraising benefit for the Chicago LGBT Hall of Fame Wednesday, July 12, 2017. The show starts at 7:30pm at Mary’s Attic, 5400 N. Clark St. in Chicago’s Andersonville neighborhood. Every $21 ticket sold earns The Chicago LGBT Hall of Fame $5. Raffles and prizes. Enjoy lost, never-before-seen episodes of “The Golden Girls“ featuring Dorothy, Rose, Blanche, Sophia and all of the siblings, daughters, sons, characters and rare diseases that were mentioned once, but never again. The production also features “The Golden Girls” trivia and games to help fully embrace the Miami experience. Single tickets are on sale at www.handbagproductions.org or by calling (800) 838-3006.